I hope you all had an excellent start of 2013! I wish for this new year to bring us peace, happiness, and all our wishes to come true, and last but not least, to keep having great times here together. In this FIRST post, you will see what I wore on New Year's Eve. Nothing sophisticated, just a short, bold printed dress and a few sparkly accessories as this pair of vintage earrings, Marc Jacobs clutch ( Christmas gift) and a Vince Camuto ring. I started the new year with colors & prints, just the way I like it ! Let's make 2013 an amazing & colorful year! so pretty!!!! !the dress is perfection!!!! LOVE THIS! THE WHOLE ENSEMBLE IS STUNNING! THE DRESS, THE COAT, THE EARRINGS, YOUR HAIR!!!!!!!!!! FLAWLESS VERONICA! YOU ARE A TRUE BEAUTY! xoxo and Happy New year! 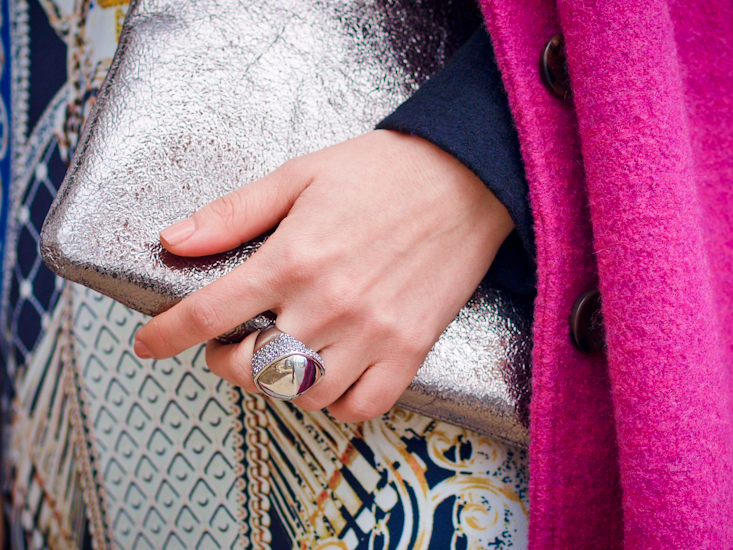 And paired with this coat it’s a real eye-catcher! Bravo. That is such a stunning dress! LOVE this look! such a gorgeous coat! I love so much your dress!!! oh im in love with print on that dress and i would kill for your collection of coats!!! what a great way to start 2013!! loooove every bit of this outfit!! the hot pink, the earrings, the shoes! gorgeous!!! I love that splash of pink o the outfit! You always wear colors in an amazing way! Maybe it’s because you are an artist!!! Love your look! Lindo o look … Vestido perfeito!!! Mmmm very chic nice choice for the 2013!!!! You look gorgeous darling in this dress, but you seems a little bit tired, are you ok ? Love the color of your coat Veronica! 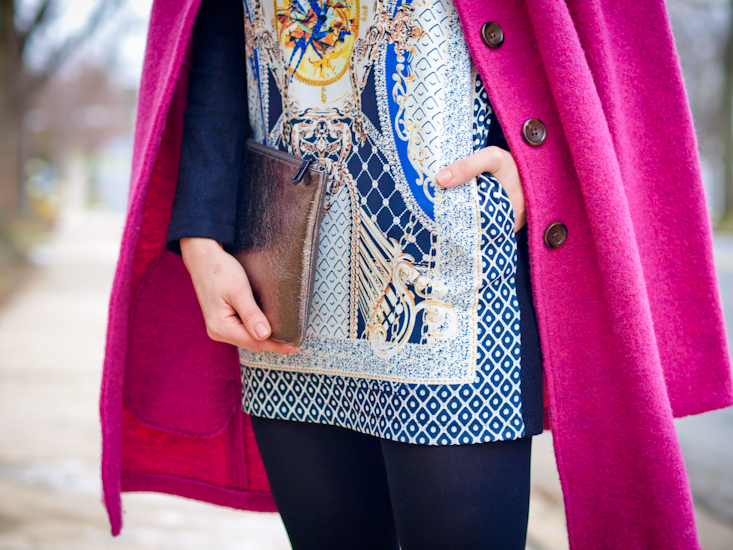 THis coat is simply the perfect pop of color, especially during these chilly temperatures! What an amazing outfit! I love that you matched this dress to the coat! I love that amazing pink coat! Yes love it so chic I love this look on you it’s really glamourous! I love this outfit! The contrasting colors look amazing! My engine started slow for 2013. Must be the long weekend and too much partying. Wishing you a great year of 2013! Love the eye-catchy bright pink! Can you post what the sunnies are too? They’re perfect! They are Ralph Lauren! Thank you! The dress is gorgeous! I just found your blog and I am definitely a follower now! It’s like a breath of fresh air with some bittersweet colours..haha..